It seems that 2013-2014 has become the year of friends, babies, parkruns and weddings. Yesterday was no different and we started the day off by running Peterborough parkrun with our friend Vicki. Vicki ran three parkruns with me earlier in the year in a bid to lose weight for my and her wedding which both fall within the next 12 months. She’s had a few months off from exercise but with the alert that it’s now just seven weeks until my wedding and her bridesmaid dress is a little tighter than she would like she’s back on it again! With an extended break, she obviously found it much tougher to keep going and we did take a few walk breaks in order that she could complete the 5k distance. Dan went off up ahead hoping for a quicker time, but a hot morning, combined with no food or drink beforehand and no runs in the last month resulted in a slower time than he would like and a quick vomit behind the bush at the finishing line. 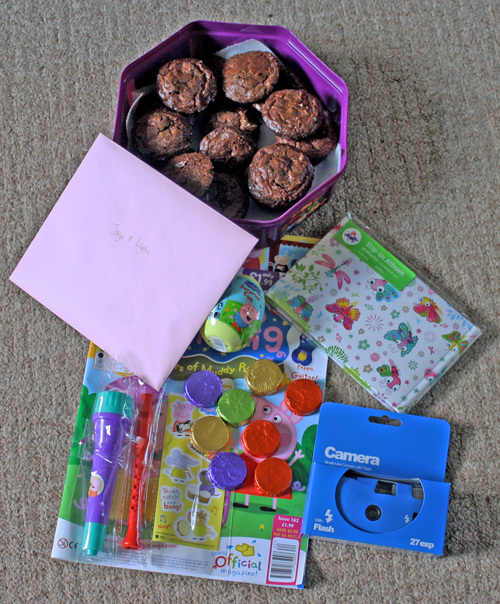 Georgia’s Mum already has a three year old daughter, Olivia and when we were deciding on gifts to take with us to Wolves I wanted to put together something to help Olivia not feel left out or jealous of her little sister in any way. After sending a tweet out for ideas earlier in the week I was flooded with some excellent suggestions, including Erin‘s suggestion of putting together a list of photos for Olivia to take along with a disposable camera. I loved this idea and on the back of some pretty paper I wrote out a list of photos that Olivia could take of her baby sister. On Friday night I baked some chocolaty brownie bites for her parents and Dan wrote in their card. I bought Olivia a Peppa Pig magazine, which came with some Peppa stickers, I picked up some chocolate coins, a Peppa Pig egg with toy inside, disposable camera, and a cute butterfly photo album from Boots. 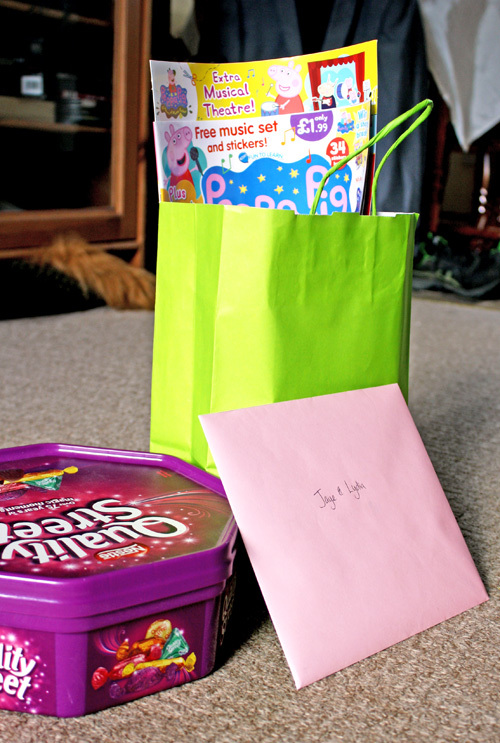 Then we tucked everything inside a little green bag, along with the shotlist of items for Olivia to take photos of. We also spent some time with Dan’s parents whilst we were back and his Mum showed us the cake board she is using for our wedding cake. I love it! It was exactly what I was imagining! The perfect rustic touch, and also massive! So big, infact, that when Dan’s Mum brought it out to us, she had to wheel it through into the lounge! 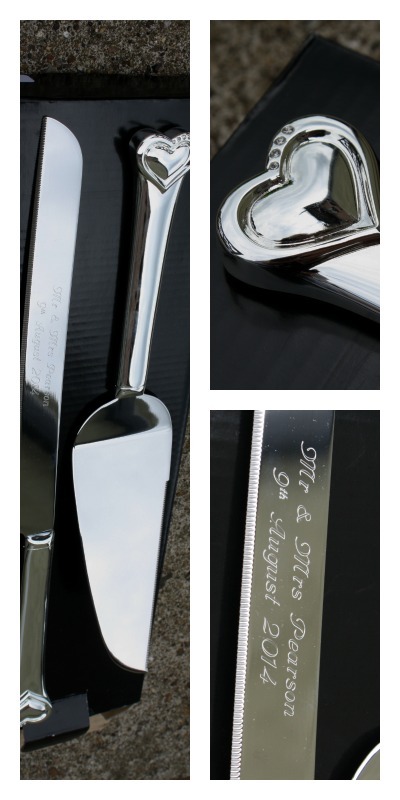 Ann also gifted us a cake knife and slice set which have been engraved with our name and wedding date. 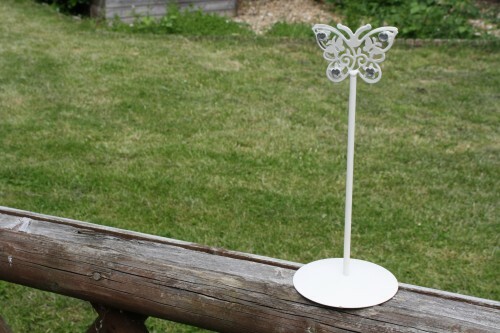 And some table number holders which she had bought for her school’s School Prom and no longer required. It seems like all we have left to do are all of the little fiddly bits, and those are the little fiddly bits which are going to fill my next seven weeks up! 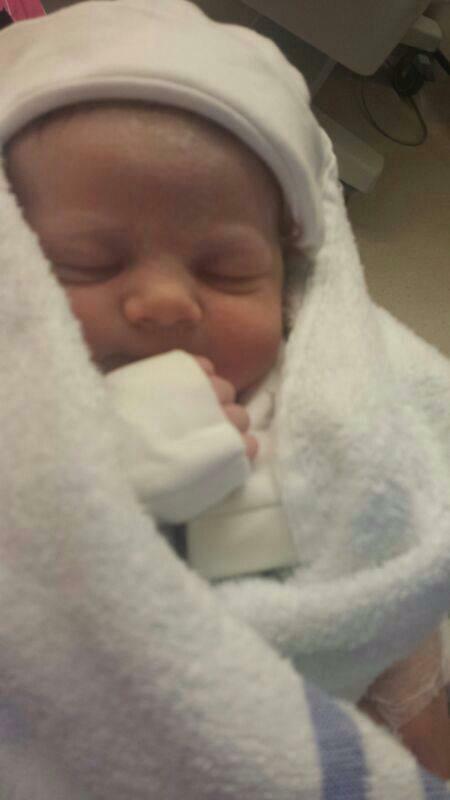 Ahhhhh, I am so broody, what a cute baby! I go through phases of being broody. Yet I won’t touch any of my baby nieces and nephews! Ha ha to the no fruit cake! The cake stand is lovely too- so unique. I am not a baby person either- one of my friends keeps sending me photos of her baby (eg as thank you cards and things) and I am not really sure what we are meant to do with the photos? Kids are much more fun when they start to talk and play properly. What a shame about your friend too- not wanting to be skinny is one thing, but it is a strange mindset to want to be thin for something specific like that. Hopefully over the next few months she will realise how great running is and keep it up! Yes, that’s a little weird getting photos of friend’s babies! I’ve had a couple of drawings from friend’s children, but I always feel awkward asking what they’re for or of! I agree about them being more fun when they can talk and play. I’ve got one six year old and one three year old niece, and a two year old nephew and they’re much more exciting! Such a beautiful baby, she is gorgeous and looks so content! Literally did not stir the entire time we were with her on Saturday! Very content indeed! 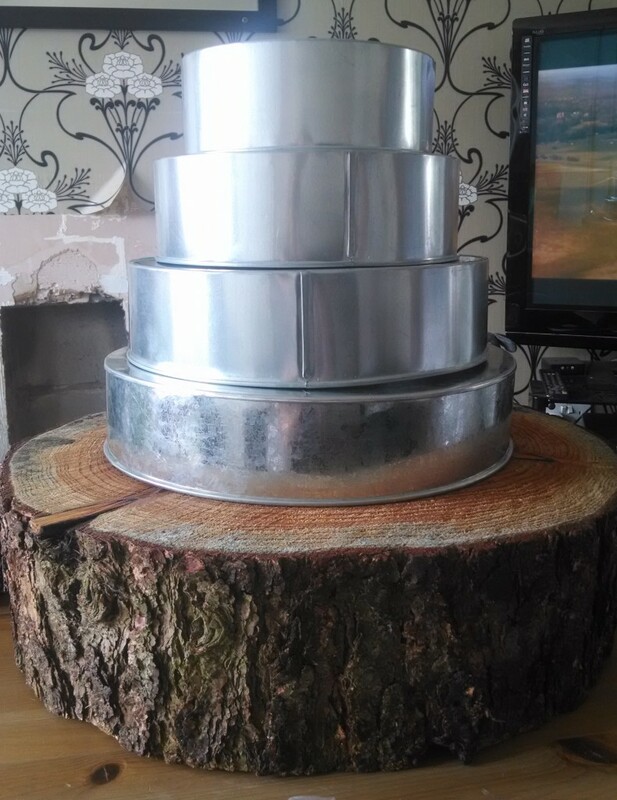 That cake stand is amazing! Thanks! It was exactly the look I was after. Although, I didn’t expect it to be quite so large! Ahh what a shame about your friend. Before I got properly into running the only reason I exercised was to stay in shape with a vague notion of being healthy alongside it. That hugely changed when I started running. Other than my obvious enjoyment and love for all things running, I run to get faster, to hit goals, to do races and I know how good it is for me mentally and physically. I do strength workouts purely to help my running – whereas in the past it was to get the “bikini body” and “toned” look. How things have changed!! Maybe she just needs to do it a bit more and find her love for it when she gets to “know” running a bit better? I don’t think she plans on changing her mind unfortunately. I’m similar to you. Initially I started running to tone up and lose a bit of weight but it got addictive, and I learned the importance of nutrition for my body and how much better I felt eating right and running several times a week. I wouldn’t change it now! 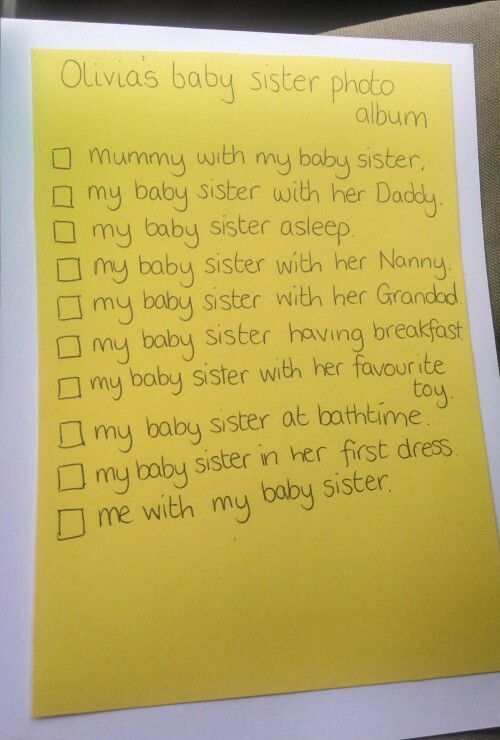 What a great idea for the little sis! I get so emotional whenever I see babies now, I can’t quite believe I’ll be pushing one out in a few months time! Shame your friend isn’t bothered about keeping up running, I do understand her views on not wanting to be skinny all the time, but you can be healthy and still enjoy your food, treats and be more curvy! Awww, it’s not long for you now! It is sad that she doesn’t want to do it permanently, but I know I will never change her. I’m not one to preach and if she’s happy then I shall let her be. Shame though. It really does seem like everyone is having babies at the moment. I have a new niece/nephew arriving in the next couple of months. I am excited! Oh congratulations! Exciting times for everyone right now!